State Bank of India has announced vacancy of 2403 posts for Probationary Officer examination - 2017. This recruitment process is for selection of candidates for the post of PO in State Bank of India and its Associate banks. The candidates selected are liable to be posted anywhere in India. Eligible and interested Candidates are required to register online for the recruitment process.The 3-tiered selection process consists of Preliminary and Main Exams which will be conducted online, followed by Interview. Candidates must pass each exam to get shortlisted and progress to the next stage. Final selection will be based on merit. The tentative schedule for the SBI PO exam is as follows. Please note down the important dates related to SBI PO Exam 2017 and make sure to complete the process in time. Click here to know more about SBI PO Salary, Job Profile and career growth. The SBI PO Main Exam has a total of 250 marks, consisting of an objective test of 200 marks followed by a descriptive test of 50 marks. Both the Objective and Descriptive Tests will be online. Candidates must answer Descriptive test by typing on the computer. The Descriptive Test will be administered, immediately after completion of Objective Test. There is separate timing for each section. The Descriptive Test has a duration of 30 minutes with a maximum score of 50 marks. This is used to test the writing skills in English Language via Letter Writing & Essay Writing. Descriptive Test paper of only those candidates will be evaluated who have scored qualifying marks in the Objective Tests and are placed adequately high as per total marks in objective test. The aggregate marks of candidates qualifying in both the Objective Tests and Descriptive Test will be arranged in descending order in each category. Adequate number of candidates in each category, as decided by the Bank will be called for Group Exercises and Interview. The qualifying marks in Group Exercises & Interview will be as decided by the Bank. Group exercises account for 20 marks while Interview accounts for 30 marks. • Educational Qualification: The candidate must be a graduate in any discipline from a recognized University or any equivalent qualification recognized as such by the Central Government. Those who are in the Final year/Semester of their Graduation may also apply provisionally subject to the condition that, if called for interview, they must produce proof of having passed the graduation examination on or before 01.07.2017. Candidates with Integrated Dual Degree (IDD) certificate must ensure that the date of passing the IDD is on or before 01.07.2017. Candidates with Chartered Accountant certification may also apply. • Biometric Verification: To ensure an error-free and secure selection procedure for SBI PO 2017, the bank may digitally capture the thumb impression of the candidate. This is done to verify the genuineness of the candidates. Any inconsistency in the biometric verification will lead to rejection of the candidature and punitive legal actions. Candidates are thus advised not to apply any kind of external matter like ink, mehandi, chemical etc. on their hands. • Number of Attempts: The maximum number of chances are fixed for each category. Candidates who have used up all the chances are not eligible to apply. Appearing in Preliminary Exam is not counted as an attempt but appearing in Mains Exam is counted. The Bank may add additional centres or may remove some of the centres indicated for training. Candidates opting for pre-examination training should download their call letter for training by entering their registration number and password/ date of birth from 07.04.2017 onwards from Bank's website. No hard copy of the call letter will be sent by post. The SBI PO 2017 application form can only be filled on the official website. The link to download the admit card of SBI PO Prelims 2017 has been given below. Candidates are advised to check the details on the admit card before downloading. All results pertaining to SBI PO 2017 will be made available on the official website of State bank of India, the governing body for the SBI PO exam. The results of the SBI PO Pre Exam will be declared on 17th May, 2017. 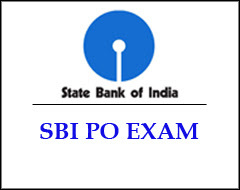 Shortlisted Candidates then proceed to the SBI PO Mains Exam. The result of the Mains Exam will be declared on 19th June, 2017. Candidates are requested to keep checking the website for further information. Results of the candidates who have qualified for Group Exercises & Interview and the list of candidates finally selected will be made available on the Bank's website. Final select list will be published in Employment News/Rozgar Samachar and in Bank’s website.